Twig growth for the season should be from 3 to 24 or more inches in length. Bark growth cracks usually indicate that the tree is healthy. Tissue in the cracks should be bright green or pink when scratched. 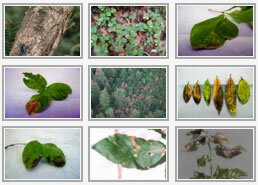 However, loose and discolored bark or unusually flattened areas on the trunk is indicative of a diseased condition. Maintain an undisturbed soil area above the root zone if possible. (For management purposes the root zone extends out 1/3 the distance beyond the drip line of the tree. The drip line is the outermost edge of a tree’s foliage). Minimize grading, digging, trenching, covering the ground with asphalt or concrete or landscape plants, excessive foot traffic, or vehicle parking. Proper management maintains free passage of water and air within the root zone. The area extending 6 feet from the trunk is the most vulnerable and should always be left undisturbed and uncovered. Mature oaks do not require pruning except to remove dead, weakened, diseased, or dangerous branches. If pruning is necessary, trees should be pruned in the dry season. June and July is best. Native California oaks have evolved in a Mediterranean-type climate where there is little rainfall between late spring and early autumn. As such, they generally do not require irrigation during this dry period and, in fact, trees may be adversely effected by supplemental watering during this period since warm-moist conditions can favor harmful diseases. It is particularly critical that the trunks of oak trees remain dry. However, if the winter season is unusually dry, then a supplemental irrigation in the early spring can complement natural rainfall. Water deeply, to one to two feet, in the outer two-thirds of the root zone. Alternatively, placing organic mulch under the tree can conserve moisture in the root zone by reducing surface evaporation. Mulch also inhibits the growth of weeds, which can compete with oak roots for moisture and nutrients. As mulch breaks down, it also increases organic material in the soil which improves water percolation, aeration in the root zone, and long-term nutrient availability. Newly planted trees may require supplemental watering while they are establishing in the landscape. These plants may require irrigation up to one every month in the dry period. A healthy, mature oak under natural conditions does not require supplemental feeding. The leaf litter and other organic debris on the soil supply nutrients as they decompose and release nutrients to the soil and roots. Supplemental fertilization may be needed when the organic debris is removed or when the oak exhibits disease or when growth is poor. Generally, young trees can be fertilized to establish them quickly. Nitrogen is the primary nutrient of value to oaks. Prior to rain or irrigation, fertilizer can be spread on the ground to cover the outer two-thirds of the root zone. An alternate application method is sometimes useful. Fertilizer can be injected with water or placed in holes dug into the ground, 18 inches apart, along the tree’s drip line. Fertilizers should be applied at a rate of two to four pounds of actual nitrogen per thousand square feet of area. (For example, if a nitrogen fertilizer contains 20% elemental nitrogen, then 10 to 20 pounds of fertilizer would be applied per thousand square feet of area). Organic nitrogen or slow release nitrogen sources are preferable. Organic sources should be applied in late winter to allow the nitrogen to move into the root zone. Inorganic sources should be applied in late spring after the first flush of growth. Drought tolerant plantings can be incorporated into the landscape around oaks. Many California native plants, once established, may require little or no watering. Again, plantings within the root zone area are not recommended. NOTE: The information on this page was excerpted from from Living among the Oaks, a publication of the Integrated Hardwood Range Management Program, University of California Cooperative Extension. For more information, click here.